CINCINNATI -- Texas Tech's Tommy Tuberville was hired Saturday as Cincinnati's next football coach, leaving the Big 12 for a school trying to move up to a better conference. The agreement came one day after Butch Jones left to become Tennessee's next football coach, ending a week of uncertainty for the Bearcats (9-3). Cincinnati has won a share of four of the past five Big East titles and will play in the Belk Bowl. Did Tommy Tuberville make the right choice in leaving Texas Tech for Cincinnati? A Texas Tech official told ESPN.com the school was "completely blindsided" by the decision. Tuberville went 20-17 in three seasons at Texas Tech, after coaching at Mississippi and Auburn. The Red Raiders (7-5) will play Minnesota in the Meineke Car Care Bowl after missing out on a bowl last season. Tuberville resigned as Texas Tech's coach on Saturday afternoon and was expected to be introduced at Cincinnati later in the day on the basketball court after the 11th-ranked Bearcats played Maryland Eastern Shore. His hiring ends a streak of Cincinnati getting its coaches from smaller conferences. It's athletic director Whit Babcock's most significant hire in his first year at the school. The 58-year-old Tuberville takes over a program that has been a stepping stone job for the last three head coaches. Mark Dantonio, Brian Kelly and Jones all left after three years for bigger programs -- Michigan State, Notre Dame and Tennessee, respectively. Kelly and Jones both came from Central Michigan, while Dantonio was an assistant at Ohio State. Like Kelly and Jones, Tuberville likes a wide-open offense. The Red Raiders ranked second nationally with 361.9 yards passing this season. His final season at Texas Tech was marred by a sideline outburst. 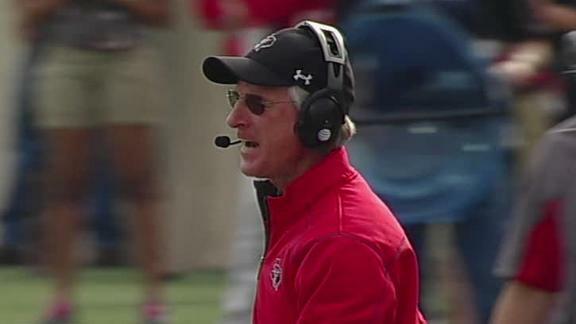 Tuberville lost his temper with graduate assistant Kevin Oliver during a 41-34 win over Kansas. Tuberville appeared to strike Oliver after the Red Raiders had trouble getting the right players on the field. Tuberville said he grabbed Oliver's headset, but wished he'd handled the situation better. It was especially notable because Tuberville was hired to replace Mike Leach, who was fired in 2009 for alleged mistreatment of a player with a concussion. After the incident on the sideline, Tuberville said he needed to set a better example for his two sons, one of whom is a walk-on freshman at Texas Tech. The Bearcats hope his hiring allows them to end their streak of losing football coaches every three years. Tuberville takes over a program in flux. ESPN.com's David Ubben writes about all things involving the Big 12 in the conference blog. The university has been disappointed by the Big East's massive exodus and lobbied to get into the Atlantic Coast Conference. Instead, rival Louisville got accepted by the ACC, leaving Cincinnati hoping it could make the move in a few more years. There's also a lot of work to do on the athletic facilities. During Jones' tenure, Cincinnati expanded its football facility, adding a practice field with a protective bubble for bad weather. The school is trying to figure out how to upgrade 35,000-seat Nippert Stadium, which is the second-oldest playing site in the nation for a college team behind Penn's Franklin Field. Nippert has been in use since 1901. Despite their Big East success, the Bearcats have played in front of disappointing crowds at Nippert. They drew only 21,171 fans on senior night -- their smallest crowd of the season -- for a 27-10 win over South Florida this year. Babcock said on Friday that the school is developing plans to improve Nippert. Information from ESPN.com's David Ubben and The Associated Press was used in this report. Steele: Can Jones turn Tennessee around? Gilmore: Better hire, Malzahn or Bielema?